Ductility test is conducted to determine the amount bitumen will stretch at temperature below its softening point. A briquette having a cross sectional area of 1 in2 is placed in a tester at 77 °F. Ductility values ranges from 0 to over 150 depending on the type of bitumen. Ductility is the property of bitumen that permits it to undergo great deformation or elongation. Ductility is deﬁned as the distance in cm, to which a standard sample or briquette of the material will be elongated without breaking. Dimension of the briquette thus formed is exactly 1 cm square. The bitumen sample is heated and poured in the molds assembly placed on a plate. These samples with molds are cooled in the air and then in water bath at 27 °C temperature. The excess bitumen is cut and the surface is leveled using a hot knife. 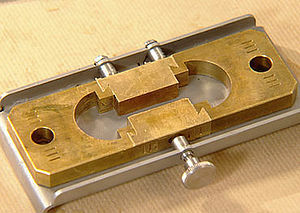 Then the mould with assembly containing sample is kept in water bath of the ductility machine for about 90 minutes. The sides of the moulds are removed, the clips are hooked on the machine and the machine is operated. 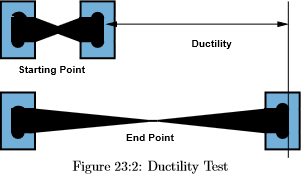 The distance up to the point of breaking of thread is the ductility value which is reported in cm. The ductility value gets affected by factors such as pouring temperature, test temperature, rate of pulling etc. A minimum ductility value of 75 cm has been speciﬁed by the BIS. shows ductility moulds to be ﬁlled with bitumen.